As a youngster, former rugby player Shaun Slicker got into fights that almost put him in prison. But in 2009 – aged just 23 – he was forced to stop fighting other people and take his battle to young-onset Parkinson’s disease. As he struggled with depression after his diagnosis, the father-of-three from Oldham, UK, turned to an unlikely source of relief, which led to his skin becoming a canvas for inspirational slogans – a reminder to never give up. 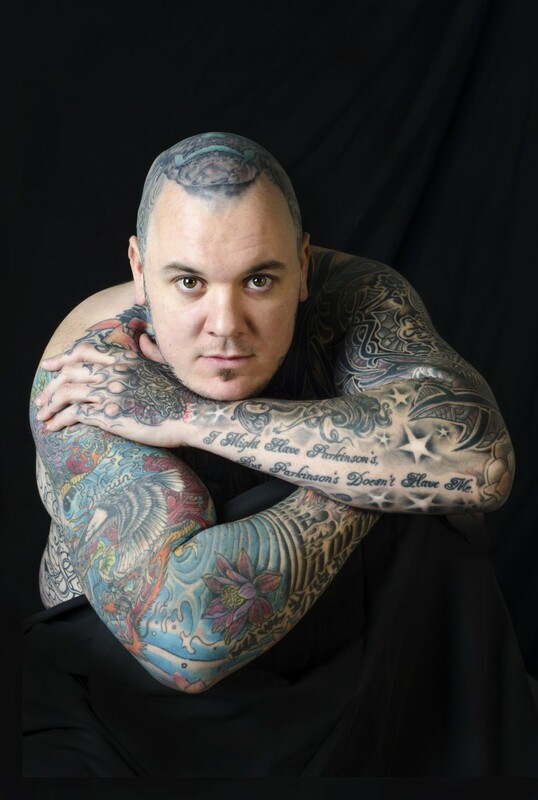 In this interview, Shaun talks openly about his troubled youth, his ‘life-saving’ addiction to tattoos and why he raises money for research by alternative modelling. How has your young-onset Parkinson’s disease diagnosis changed your life? It’s changed my life in a big way, but not completely in a bad way. To be honest, after three years of being poked and prodded I was quite relieved to be told it was Parkinson’s and not something worse. It’s made me grow up and think about possible consequences to my actions because I used to be a wild child and bad lad. I used to fight a lot in my teens – I would go out drinking and then end up fighting in the streets. I was known to the police and I would probably be in prison my now if it wasn’t for my Parkinson’s diagnosis. I’ve got more to lose now as my two daughters, who are aged six and seven now, were born around the same time as my official diagnosis. I also have a son, Kenadee, who’s five. I have to be around, and I have to stay on top of my symptoms, to bring all of them up. How did tattoos help you get your life back on track? Soon after diagnosis I went un-medicated for around 18 months, because the side effects were so bad. But I couldn’t move without the medication – I would have to crawl from my living room to bedroom. I became housebound and put on six stone. And I became really depressed from staring at the same four walls. One day I snapped out of it, and thought that I would get a tattoo done to force me to get out of the house. Then I started getting more and more to give me something to look forward to, which later became not only an addiction but also a lifesaver. I have now also stopped drinking and lost all of the weight – I feel much better. So my Parkinson’s triggered this tattoo obsession that helped me turn my life around. When did your obsession with tattoos begin? I got my first tattoo at 14 years old – my own initials on my arm – so I’ve always been fond of tattoos. To pay for it, I swept the local nursing home car park for six weeks. But I didn’t really get it done to look cool; I just always wanted a tattoo due to my dad having them. Before my diagnosis I began to get a few more tattoos. I had a tribal tattoo, an eagle and a Tasmanian devil on the top of my arm. How many tattoos do you have and which is your favourite tattoo? I couldn’t tell you how many tattoos I have, it would probably be easier to tell you how many tattoos I haven’t got! 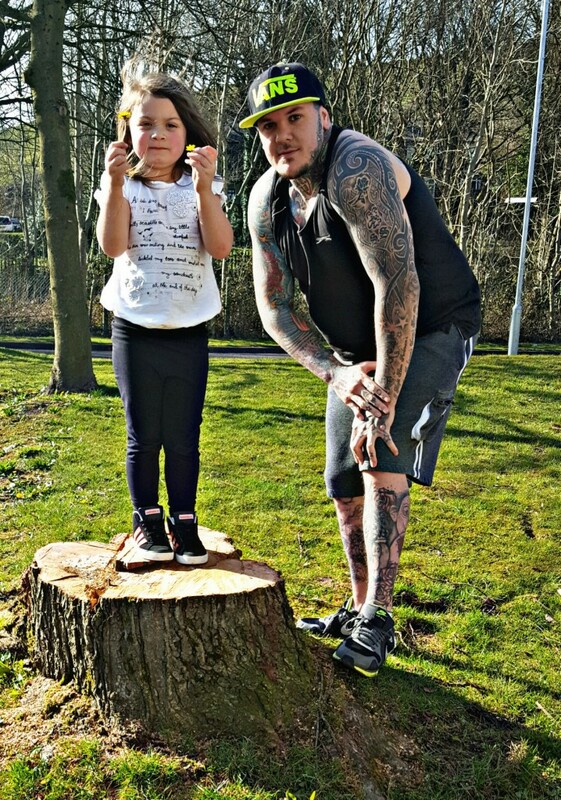 I would say my favourite tattoos would be my daughter’s footprints. Do your daughters understand your condition? What do they make of all your tattoos? 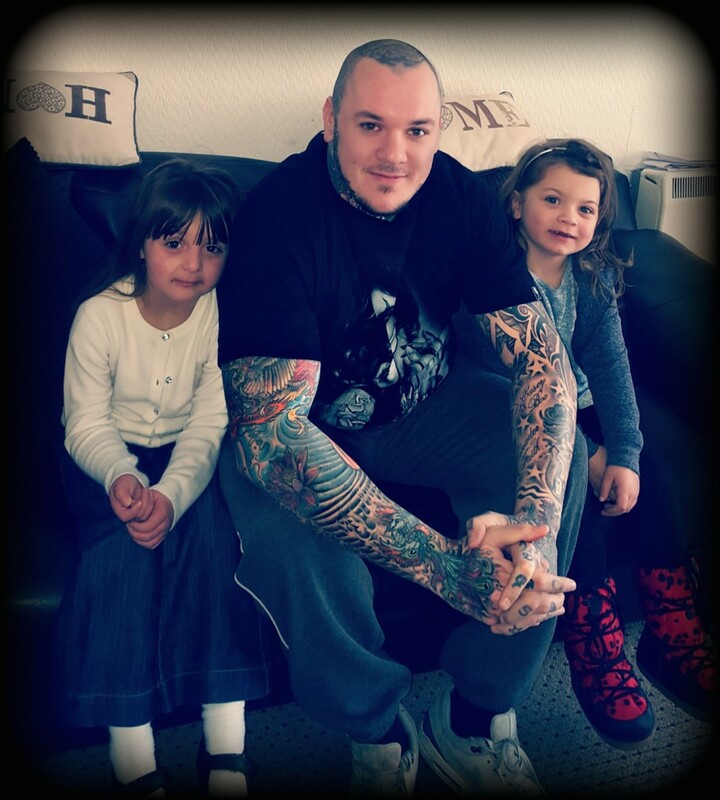 My children are used to my tattoo lifestyle as it’s all they’ve ever known! Even though they know that their daddy has Parkinson’s. I’ve explained it to them numerous times, I still don’t know if they understand exactly what it really is, due to them being so young. 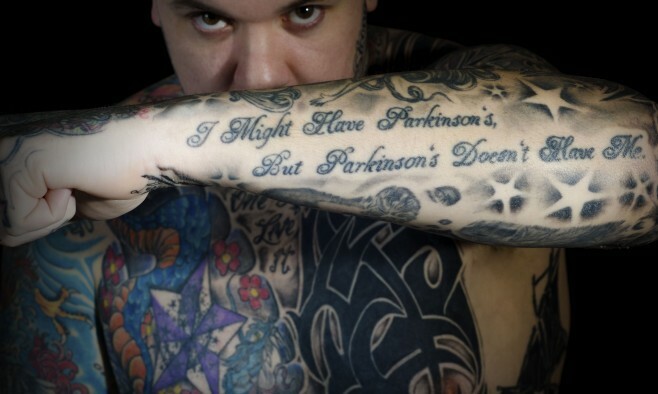 You have a prominent tattoo that reads: “I might have Parkinson’s, but Parkinson’s doesn’t have me”. Where does this fighting spirit come from? I don’t dwell on the negative things and try not to think things like ‘in five years I might be immobile.’ I just live my life in the moment and live it to the full. That tattoo is a reflection of my attitude. I guess I get my fighting spirit from playing rugby from the age of five and I am very stubborn so I don’t like to lose. Your sister, Kirstie, also has young-onset Parkinson’s. How did your family react to your sister’s diagnosis? To be honest no one in the family was surprised that my elder sister had Parkinson’s, because she basically had the same symptoms as I did originally. Well we used to call her ‘The Claw’ because she would get stiffness and rigidity in her hands. When she went to the hospital she got her diagnosis after four months. I think that may have been because of my condition – doctors knew what her symptoms might be pointing to. I believe it’s not that rare for family members to have the same disease but I believe it’s very rare for two siblings to have young-onset Parkinson’s. It’s important that people know that Parkinson’s can run in families to help the diagnosis process. How important is it that other people with young-onset Parkinson’s disease meet up and are able to share their experiences of living with the condition? I think it’s very important for people with Parkinson’s to communicate with each other and share symptoms and tips on how to cope with certain things. You never have to be alone with the condition because there’s always someone out there that can relate to your situation. Tell us about your alternative modelling. I started to do alternative modelling when I got asked to be a volunteer model for a photographer to enhance her portfolio. And then I realised that because I am a bit of a poser, I can put my tattoos to good use to raise money for Parkinson’s research! I thought I’d give a go, and since then my photos have been published in an American tattoo magazine. You can follow my journey at: www.facebook.com/tattooedslicker. Why have you donated 50% of your modelling money to Parkinson’s disease charities? I’ve done fundraising for Parkinson’s awareness since my diagnosis in 2009. Parkinson’s is going to be my long-term future, so why don’t I give something back?! Raising money to help find a cure – if not in my life-time then maybe for the next generation – is very important to me and my family.